Frenchglen is a remote community located in Oregon’s beautiful high desert at the base of Steens Mountain. From this remote location, we strive to ensure that children in our community get a quality education providing them with the tools they need to become productive members of society. The students at Frenchglen School have limited opportunities for exposure to a wide variety of programs that students in urban locations may take for granted including: music education, access to and instruction in technology, field study opportunities, civic & social responsibility, as well as opportunities for cultural diversity. The Frenchglen School has a major funding crisis as our State school funding has fallen far short of the funds necessary to maintain our current quality of education. As a result, our community has formed the Frenchglen Education Foundation. The Foundation, a 501(c)3 non-profit, was formed to maintain, enhance, enrich & improve the opportunities for growth and achievement in the areas of education; cultural diversity; ethical, and civic and social responsibility for children living within the Frenchglen School District. The Frenchglen Education Foundation conducts several fundraisers including specific and ongoing events. Priorities for spending funds generated focus entirely on program funding and include: music education, technology, math, science, field study, art, and civic responsibility. Given our school’s funding history from the State of Oregon, we believe that it will be necessary to continue these fundraising efforts in an ongoing fashion in the years ahead. If you are interested and willing to support our community and our school, you can do so in a number of ways right here on our website. On our donate page, you can use the donate button and make your donation online. Additionally, our 4-8 grade students have produced a DVD with the history of Frenchglen called "Frenchglen: Now and Then". The DVD is available online from the Foundation. Other fundraising programs can be found listed below or on our fundraising page. Your contribution is greatly appreciated. The Frenchglen Cookbook is completed and published, and is a beautiful, hard cover, spiral bound book full of amazing full color images of Frenchglen & Steens Mountain. It is packed with over 200 recipes compiled from a wide variety of present and former community residents and fans. You can add it to your cart right now and purchase via paypal or your credit card. 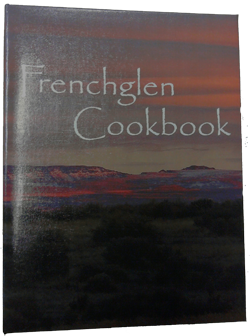 The Frenchglen Cookbook is $20 plus $6 shipping. If you prefer to pick yours up in Frenchglen or somewhere in Harney County, just include a message to that effect with your purchase. View the Cookbook Preview. The Harney County Rural School Night on the Town Fundraiser is scheduled for March 10, 2018. This event is hosted at the Harney County Fairgrounds Memorial Building in Burns, Oregon, and will include a fabulous tri-tip dinner, the band Countryfied live in concert, and both a silent and live auction. All of the rural schools in Harney County, and their supporting organizations, are invited to participate in the silent and live auction events. All proceeds from the silent and live auction items go to their respective schools or organizations. If you have an item to donate, please contact the foundation at the number below. Purchase tickets to attend by following this link. Visit the Frenchglen Elementary School webpage.